Indeed, if there is any actual threat to “free speech”, it can be found in how Rappler goes about reporting about its own predicament. Rather than highlight the true facts surrounding its case which all point not just to Ressa’s negligence as CEO but to a seemingly deliberate effort mounted by her company to circumvent corporate regulation, Rappler‘s reporters put up mere strawmen. Rappler, in fact, has a spotty record when it comes to abiding by the law. Back in 2012, Rappler “reporters” Magtanggol de la Cruz and Carmela Fonbuena published the balance of one of Corona’s foreign currency deposits in an article that bears the ironic title ‘Secrecy in foreign currency deposits‘ dated the 8th of Feb. Fonbuena reveals not only that dollar amount but the account number where it is deposited as well in that “report”. Ressa speaks with some sort of self-administered authority on what it means to “take responsibility”. Yet to this day we have not seen any sort of action taken or rectifications made with regard to the behaviour of her so-called “online journalists”. It is high time Maria Ressa be taken to task for the irresponsible management of her “news” media organisation. 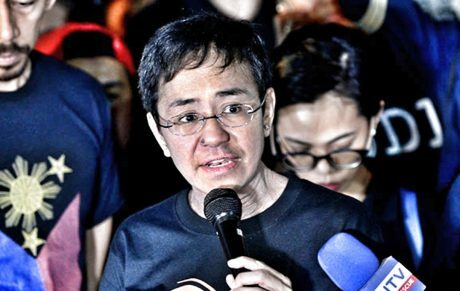 The case surrounding alleged tax evasion should be regarded with a critical mind before even considering the lame and desperate appeals to emotion being dished out by Ressa and her henchwomen. If Maria Ressa can not provide accurate information to the BIR or the SEC about her “baby”. Why the hell should we trust the information coming out of her baby?? The press is supposed to cover the story and not be the story. You would think she learned this when she was in CNN. Rappler came into being to help legitimize the reign of idiocy back in 2012. Look to Rappler for accurate and reliable info the same way the Queen in Snow White would look into the mirror asking that famous question of hers. Maria Reesa and her Rappler are not the embodiment of “Press Freedom”. The are just one of the media sources in our country. She should pay her taxes, like everyone of us do ! RESSA IS ASSAULTING THE DULY ELECTED PRESIDENT to this day remains extremely popular than Ressa. Duterte voters, likewise, are assaulting Ressa and Rappler. The difference between these “ASSAULTS” is there are more Duterte Lovers than Ressa lovers. Therefore, in socialmediadom, Ressa is outnumbered. TOO BAD. IMPENDING ARREST OF RESSA !!! Ressa is not above the law or semblance of it but Ressa should be arrested. HERE IS MY PROBLEM WITH PHILIPPINE FAKE NEWS the fake journalists and fake columnists, possibly all graduates from U.P., already know of the impending arrest. ANOTHER ISSUE is these fake columnists do not consult constitutional or business lawyers about Ressa’s “impending arrest”. They write columns as if they are expert of applicable laws which unfortunately lawyers in the Philippines do not know their laws.